By popular demand the Tot Club now has a ‘blog’ page. This is really a supplement to Members’ Submissions but will contain either links to websites which some members have set up to keep friends & family informed of their whereabouts, travels, etc., or complete reports and photos as submitted in their full, unedited and unadulterated format with spelling and grammar mistakes. 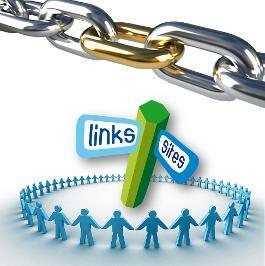 Any member wishing to send a link or a ‘blog’ click here. Sleeper has just completed the Middle Sea Race. 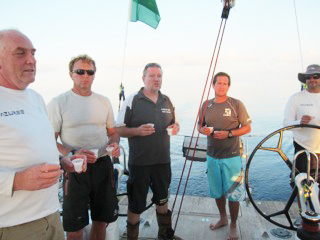 It ended up in gruelling conditions, however before that we managed a Tot after rounding Stromboli, Tot members included Jack and Jonty Layfield, Ian Frost, Rob Mc Clean and George Thompson, we had another 6 guests onboard, including one Frenchman, who we have now adopted as a nominal Englishman. After the start we had good winds and were lying second in class and 2nd overall, at the Straights of Messina, then once we got to Stromboli the wind died and it took us 48 hours to complete 100 miles, Sleeper is very slow in these light conditions and we dropped down the placings badly, we had to get back into the pack and we knew there was a Mistral on the way with winds forecast for 25-30 knots, we had to get around Trapani before the Mistral kicked in, luckily we achieved this as this turned into a beat, we were concerned for the smaller boats as we knew they were going to get a thumping. Thereafter the first 88 miles was a tight fetch and the wind increased and we ended up with storm trysail and no 4, at the next turn point at Pantelleria, with a reach of 86 miles to Lampedusa the wind freed and we put up the jib top and started to motor, hitting top speed of 23.5 knots, next and final main turn point was Lampedusa with another 90 miles to Malta, here we had slight respite in the lee of the island, we knew at this stage the weather forecast was going to deteriorate as the wind was going to head us and increase to 40 knots, little did we know we were going to get much higher wind strengths, it was a dark wild night, the seas were huge and confused, for a while the wind was steady around 45+rising to 47, the real problem was the waves, around 10.30 pm Anatole, Topman, jack and Scotty were on watch and 3 monster waves hit us knocking the boat flat, then the 2nd and 3rd waves just dumped tons of sea water, thank God the crew held on at this stage, the off watch crew thought the mast had come down as the cracking of the seas on the deck gave this impression the mast breaking, below decks was a mess as everything was dumped to leeward during the knockdown, the boat just came back up and kept going, she really is some boat and never once broached in these conditions and looked after the crew superbly. The race control had reports of up to 60 knots with 49 boats finishing and 76 boats retiring. There were a number of broken masts, steerage etc,,. Eventually we made Malta and with relief finished the race in 35 knots of wind beating for the finish. Got to Malta and as you can imagine a few beers were consumed, and of course a final Tot! Thank you for all your news letters and updates. For your information we fly the Tot Club pennant together with the OCC burgee throughout our sailing season with pride, in the hope that we may come across another Tot Club member on passage. Last year we had the good fortune to happen across David & Sue Baggley. I believe you welcome members’ logs for the year’s cruises. 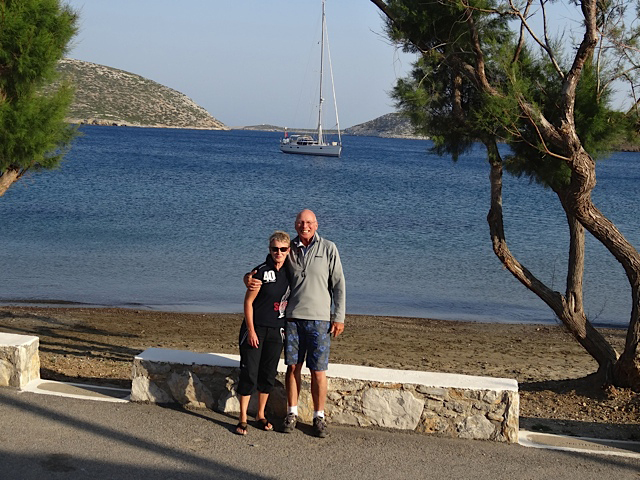 Jan and I, sailed SotO around the Turkish coast from Kemer to Datca then across the Aegean through the Corinth and on up the Ionian to Corfu and back for which I attach our log and will accompany this with a few photos which I will send under separate cover. We were delighted on our return on the 4th May, to find Song of the Ocean exactly as we had left her. The Kemer yard had been as good as their word in keeping watch and making sure the batteries remained fully charged. 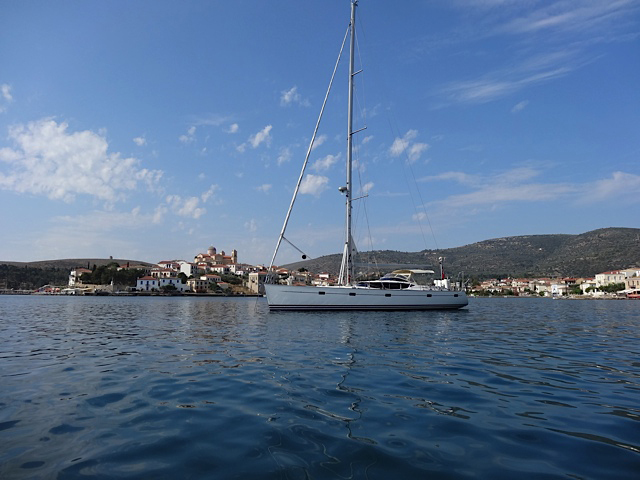 After a 10 days fitting-out, we were underway for a shake down sail to Ceveviz looking like a “new penny”. The anchorage is one of the most dramatic in Turkey and reminiscent of a Norwegian fjord with its cliffs rising to 600 metres. 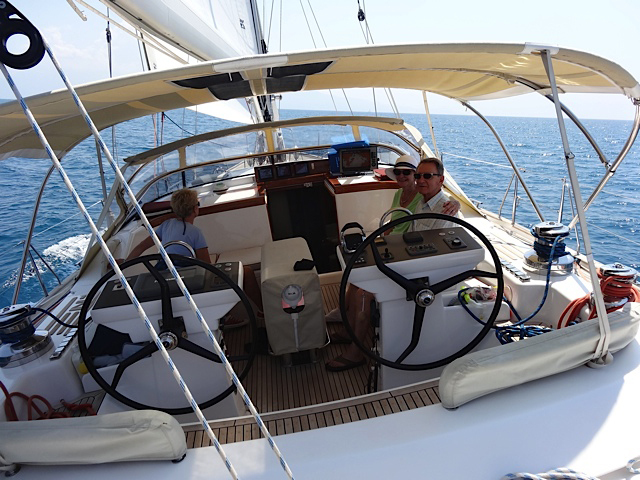 Next we made across the Finike Korfezi for Goekkaya Limini where we were delighted to cross tacks with Michael & Christine Buerk's Malo, Summer Song, on the Yachting Monthly East Mediterranean rally. We reveled in a light fine reach. Song of the Ocean is particularly adept in these conditions as with fine tuning, she doubled the 6 knots true wind to a useful 12 knots apparent to provide a good passage time. The following day with everything working to order, we sailed with a continuing light NW to pass Greece's easterly outpost of Kastellorizon, for Kas marina. This is a new development conveniently placed for old Kas township which was once Greek. This no doubt accounts for some of its delightful architecture. The next leg past the Seven Capes needs to be undertaken with an eye on the weather as the sea conditions with the backwash off the high cliffs, can create turbulence sometimes referred to as a washing machine effect! However the wheel of fortune continued to shine upon us to give an uneventful passage to Karacaoeren; it comprises a small inlet with a sole taverna. Onwards around the Iblis headland we sailed next day across the Bay of Fethiye for Gocek which many consider to be the epicentre of Turkey’s yachting society. Although the marinas have become the haunts of the Russian "nouveau riche" with their extravagant motor yachts, the town is chique and inviting with upmarket provisions, restaurants and shops. We have considered basing Song of the Ocean there with its proximity to Dalaman airport but are deterred by its lee shore lift-out. We sailed onwards to Ekincik, a large bay open to the south with an interesting marina at the SE entrance called My-Marina. Here you can free berth on the proviso you dine at their restaurant. We decided following a testing beat up from Fethye Bay, to anchor for the night and take advantage of the continuing good forecast for Serce next day. This is another interesting anchorage with its mushroom stem entrance between cliffs leading into a elongated sphere where the options are to anchor in the north with its taverna and mooring buoys or south with its abandoned taverna and grazing cattle. We chose the latter for a peaceful night’s sleep. We had been planning to check out of Turkey at Bozburun which lay 15 miles around the Dalisa Yasak Saha headland and 6 miles east of Symi, Greece. However, on arrival I was disappointed to find that the Turkish government had withdrawn their Customs and immigration offices and that we now had to make for Datca. 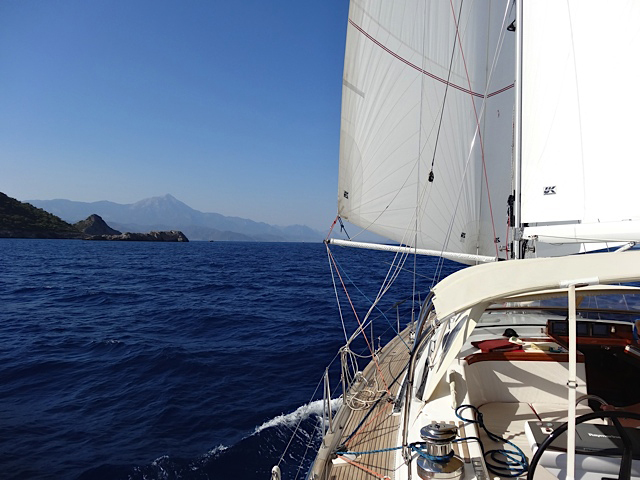 Although only 20 miles along the coast it by-passes Symi and in addition, normally involves an upwind sail. The anchorage at Bozburun is tight and following a meltemi storm that night we fouled our anchor chain around Gullet anchors. As anybody knows who sail these waters, the Gulletts are a “pain in the proverbial”. They pay no attention to the rules of the road other than "right gives way to might" and are a law unto themselves. Their anchors were dropped some 250 metres from the gullets who sat in 2 metres of water tied stern-to a sheltered harbour wall. Unfortunately, I hadn’t a dive tank aboard (since rectified!) and was left to the mercy of the local diver to gain release. Anyway, 250 Euros lighter, we were able to make for Datca in no doubt that we shall not be returning to Bozburan anytime soon. On a brighter note after a good beat to weather in 12 knots of wind, we checked in at Datca through Ahmet of Knidos Yacht Services for a mere 50 Euros. Symi would have to wait for our return. We made for Bueyuek Koy at the bottom of the Datca peninsular; an absolute gem of an anchorage between the mainland and a virtual island connected by an isthmus with attractive tavernas. A great place in Spring which unfortunately suffers from its own success in the height of the season, as is the case with many of the fleshpots around the Aegean’s perimeter. Following a breezy beat down the peninsular, our arrival luckily coincided with the departure of the gullets to leave us with a prime anchorage. This heralded our farewell to Turkey as we reached up to the Island of Kos. The marina is somewhat sterile but functional and having checked in, we made for the Customs to a less than warm welcome. They don’t realise that even they have a part to play in digging their country out of economic ruin. On submitting our papers we were advised that we could only be allowed a month in the country as a result of our Jersey registration despite the fact that EU rules allow eighteen. Anyway, after a laborious debate with a mistaken official, we were able to establish our correct status. The part of their attitude that is difficult to comprehend is that the issue had nothing to do with tax so why I wondered, would they go to so much trouble to restrict us to one month’s expenditure when we had come to inject three months worth of living and running costs into their economy. Furthermore, this not inconsiderate sum could be doubled if we then laid up in a Greek yard for the winter but I suppose that goes to the very crux of the countries economic woes. 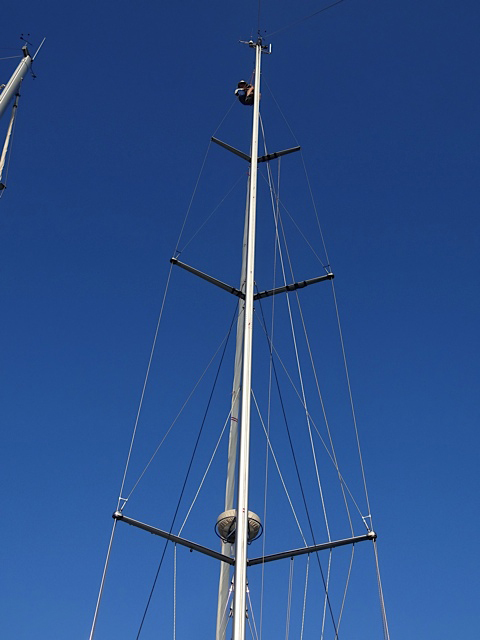 I took a day out to polish the stainless steel including the rod rigging ( at 27.5 m.altitude!) together with hand washing the teak decks, only to emerge the following morning to find everything coated in sand from a Sahara dust storm…... and they wonder why I believe in the "little people”! This continuing unstable air led to a thrash to weather down the SW coast of Kos for Ormos Kamari to an off-beach anchorage sheltered by rocky outcrops from the SW swell. We were in poll position for a breezy reach down to Astipalaia the following day. It is one of our favourite ports of call and away from the madding crowds which is particularly refreshing in high season. It also marks the centre point in ones transit across the Aegean sea. 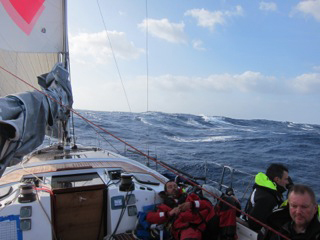 This windy spell continued for our reach to the island of Ios, some 50 miles to the west. 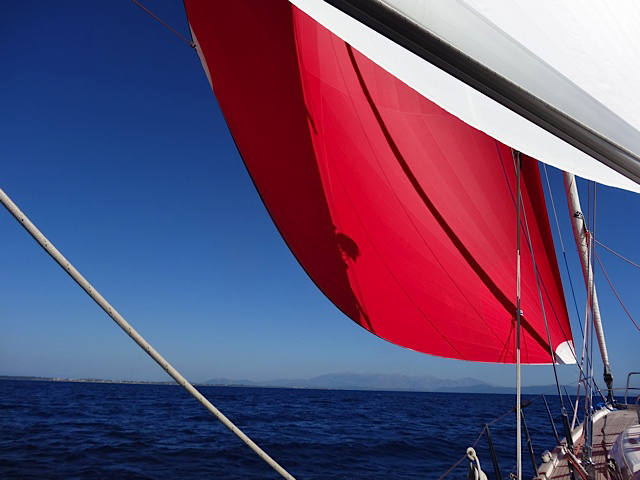 With reefed main and jib, we sliced through the waves with determination. We had planned to make up the channel between Ios and Sikinos but near gale conditions met our arrival to leave us quite contented to anchor the night in the southern anchorage of Manganari. That evening we were accompanied by the super yacht Liander who after much toil, succeeded in setting their anchor sail; what a difference it made and was a timely reminder that we also carry such a sail which needs to be use. Respite from three days of strong weather greeted us next morning and with some relief we sailed in gentle seas to the delightfully sheltered harbour of Vathi, Sikinos with its quaint shore-lined Greek restaurants and mini-markets. It’s always tempting to while away a day in such an oasis of tranquility but we were on a mission (what’s new!) to meet Ian & Judy Jenkins with whom we sailed across the Atlantic in tandem in c2002. Another gentile sail brought us to Koutala,Serofos followed by a 50 miles fine reach to Poros; its anchorage at Neorion is delightful with a local shop and taverna although not as popular an anchorage as some of the other options. We were now left with just 30 miles to sail for the Corinth and anchor overnight off the slightly dubious looking village of Palaion Kalamakion. 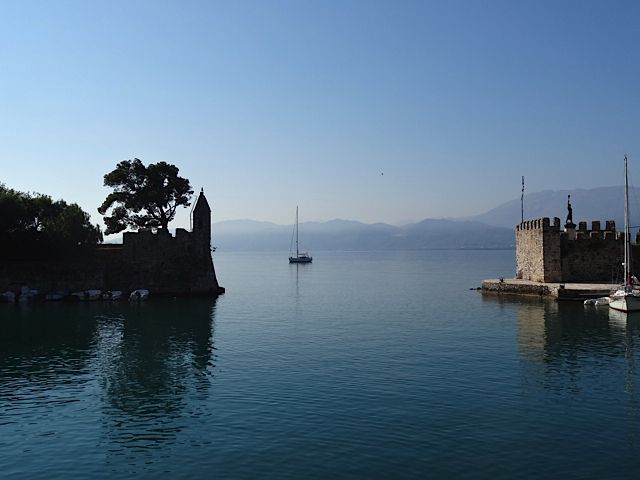 Having “cough up” 360 Euros for the Canal transit, we made NW across the Gulf to Galaxidi, a "must visit" of a town with good harbourside stern-to moorings and offshore anchorage. It is centred around an imposing hilltop Church with a plethora of family run shops and tavernas, all with the time of day to pass. As the intention was to spend a while on our return, we set sail next morning for a beat down to Navrakpas in the Gulf of Patras. This placed us in fine fettle to pass under the spectacular Rion bridge and onwards to Mesolongion. Here there are or should I say were, three options; go into the marina, tie to the town quay or anchor in the spacious harbour. We’ve always taken the latter option despite some poor holding in parts. Having satisfied ourselves that we were safely secured together with another dozen yachts of the same mind, we whiled away the afternoon. On settling down to our evening meal however, the port police made every boat up-anchor and take up one of the other options. All very Greek and inconsiderate; I can only presume that a yacht had previously come to grief by not securing its anchor and as a result, in true Greek authoritarian attitude have prohibited all future anchoring by whom in any event, they consider are a bunch of “saturday night sailors”. A far as we are concerned we will not return to Mesolongion which has little else to offer the cruising yachtsperson. Next port of call was Ithica. We set off full of enthusiasm for a gentle reach but soon had our optimism dashed to leave us to motor most of the 40 miles. Our arrival in the Ionian sea quickly introduced the problem of lack of anchorages. Following on our experience in the Aegean, we hadn’t given this much thought but now found that unless one was prepared to anchor stern-to a rock or tree then swinging anchorages are a scarcity. This is further exacerbated by the otherwise sweet local harbours being either too small for our boat or fully occupied with charter boats and tourist traffic. We anchored in Dnexia which is quaint and delightfully unpopular bay near Vathi and provides secure holding in all but northwesterly winds. After this it was north to Ormos Vlikho, Nisos Lefkas, a gem of an anchorage in a virtually landlocked lagoon. Forego the lure of Tranquil Bay and motor right into the bosom of the anchorage, a veritable hurricane hole with good shoreside facilities. 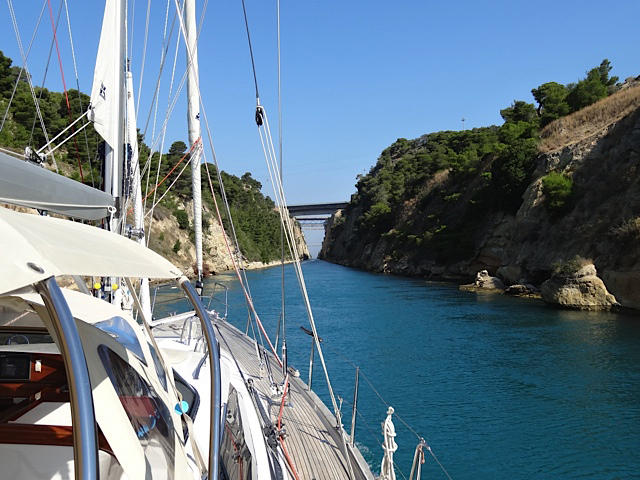 This placed us in good stead for negotiating the Lefkos canal and onwards to Ormos Pargas, another good anchorage set beneath a Norman castle with excellent shoreside tavernas and facilities. One final sail up the Corfu channel and we were at Gouvia marina where we were to await our good friends on their Amel 53, PenAzen. En route we passed The Amir of Quatar’s super yacht Katara; what a sight if of course, you are into the ultimate in opulence. I hadn’t been to Corfu since c1966 and found it a far cry from the rural island that I recalled. It now swarms with tourists and vehicles that drive too fast. However, the island possesses an outstanding rigger who made an excellent job of re-tuning our rig to add a marked improvement to our sailing performance. In all, we spent a week in Gouvia and following our farewell to Ian and Judy, made south for Ormos Levkimmi in the south of Corfu. We went on to visit Paxoi island but couldn't find anchoring space so had to make for Ormis Pargas again before continuing next for Preveza with its inland sea. A mark of this season’s sailing was the frequent use of our 235m2 asymmetric spinnaker, in fact it was flown more often than all the previous seasons put together. Having transited south through the Levkos canal we made for Ormos Vlikho and then on to Ithica; we had had bigger plans for the Ionian but couldn’t find sufficient anchorages other than tying stern-to the shore; one day we circum-navigated Ithica and trawled down the east coast of Cephalonia only to find our having to return to Vathi, Ithaca to anchor; in despair we abandoned the Ionian for Navrakpas. It has a small harbour that can accommodate much larger yachts than are encouraged, however we anchored outside the old entrance. It is a gem of a town full of historic interests with its castle and harbour wall embattlements. Furthermore, the local traders are welcoming and appreciative of ones trade. We whiled away a day before making for Galaxadi. In a gale of wind with the Simbo rig (www.rhbell.com/simbo) we flew up the Gulf of Corinth at 9 to 12 knots in a helpful following sea. On reaching the SW headland of the bay of Kolpos, we calmly came onto a reach with the release of the weather jib to leeward to make up the final 5 miles to Galaxidi. This exhilerating sail was followed by an unsettled weather pattern which kept us on anchor-watch throughout the day in 45 knots of wind tumbling down the 1200 metre mountain range to the west of the town; the whole boat was covered with flying spray despite being only 400 metres off the weather shore; unbelievably, an Italian with a similar sized yacht, took leave for the day sightseeing whilst his yacht lay at the mercy of the weather. One lucky man! After the storm, we sailed for the Corinth canal and returned to our anchorage at Palaion Kalamakion before making for Poros and onwards to the Olympic marina by Lavrion, to await the arrival of my son James and his partner Stacey. They were with us for a fortnight’s cruise across the Aegean. We started with a sail to Nikolaouisle, Kea, an absolutely delightful anchorage with its shoreside tavernas then continued south for Kythnos, Serifos and Sifnos. From there we had intended to cross over to Paros but because of a forecasted meltemi made for Ios.This avoided the meltemi but placed us in the path of a depression coming across from Sicily. We settled on the eastern anchorage of Tris Klisies which is surprisingly, rated as possessing poor holding; we found no such issues and were consoled to find that the local fishing fleet had also sought shelter in the bay. Next port of call was Analipsi, Astipalia followed by Livadia,Tilos. Our north westerly winds gave ideal conditions for a lively broad reach to make light of the 50 miles per day sails. As a matter of good fortune, Tilos was organizing its annual feast to commemorate Agios Panteleimon. The celebration lasts for three days including food, wine and dancing. It is the biggest festival in Tilos and it takes place at the Monastery of Agios Panteleimon, the patron saint of the island. It is attended by nearly all the locals who welcome us visitors. Our last sail with James and Stacey was across to Pedi. It had been a "toss up” as to whether Vathi,Sifnos or Pedi, Symi were our favourite ports of call from the previous season. However, I hadn’t allowed for the height of the tourist season in my assessment! Both anchorages proved a nightmare, jammed to capacity with inexperienced yachting holiday makers who took any advice as a personal slight on their manhood if not their nation and when kindly advised that they were anchored too close or that they were dragging gave the rhetoric of a city cabbie!. What with the heat and the pressures of the charter season, we will not be sailing in the Med. in August again. After our guests' return to "Old Blighty”, we checked back into Turkey at Datca and casually pottered around the coast to Fethye to recover from our on-call hospitality! One of our best discoveries was the new marina at Ciflik developed by the adjoining hotel where on an agreement to eat at their charming outdoor restaurant overlooking the bay, one can moor free with wifi, power and water all included plus the use of their freshwater swimming pool. No brainer! For the final week of the season, we collected Jan’s mum Ann and Stepdad John from Gocek for a leisurely run down to Karacaoeran and then pass the seven capes to Kas. Thereafter it was on to Goekkaya Limini with its refreshingly cool under sea spring water. This is not only a relief for bathing when the outside ambient temperature is 40oC but also cools the hull for a more peaceful night’s sleep. Our last port of call before the winter laying up process at Kemer, was Ceveviz which brought the curtain down on a successful 1700 miles cruise for the season and my 60th year of membership of the Royal Burnham Y.C..